What Causes a Garage Door Pulley Cable to Come Off the Pulley? Garage door opener systems must be maintained to provide smooth operation throughout the years. Opener systems can develop a number of problems, including electronic problems with remote control units, chain slippage, faulty roller action and cables that come off the pulley system. Some of these problems can be repaired by the homeowner, but because of the inherent hazards of garage door opener systems, some problems are best handled by a professional. Garage door opener systems may be chain-driven, belt-driven or screw-driven. The cables are the parts that do the work of lifting the door and releasing it when it is closed. These cables can become frayed and worm, requiring replacement. This work should be done by a qualified garage door contractor. These cables can also come off the pulley system, causing malfunction in the opening and closing operation. 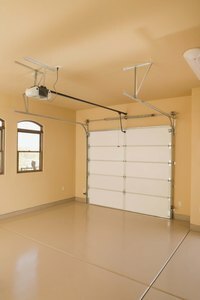 Garage door openers can malfunction for a variety of reasons. Problems often occur because of lack of lubrication in the moving parts in the system. These moving parts of your garage door opener system, such as the hinges, rollers and tracks, should be lubricated semi-annually, according to the Garage Door Care website. A spray lubricant such as WD-40 or a 3-in-1 oil specially formulated for garage doors provides the best lubrication. Inspect the system periodically to repair small problems before they become larger. Tighten loose brackets and replace broken rollers or other parts. Cables may come off the pulley system because of uneven operation on the two sides of the door opener system. Homeowners may be alerted to this problem by excessive noise and rattling from the cable-pulley system when opening, according to the Frank’s Garage Door Repair website. Generally, if you replace parts on one side of the system, you should replace them on the other side, because these parts tend to wear out evenly. Cables can also come off the pulley because of loose spring tension. When a garage door cable comes off the pulley, the tension on the pulley must be first released and then restored. This procedure can be hazardous if you are not experienced in working with cable garage door opener systems. Connecting the cable back onto the spring requires some strength, and you will need the help of another person to successfully execute the repair. If you have any doubts about your strength or skill in this operation, you may want to hire a garage door opener contractor to do the work for you. It is often worth the money to prevent injuries caused by shoddy do-it-yourself repairs.